Try, this exciting new twist on this classic recipe. Traditionally the eggs are served on a slice of cold thick ham, adding slow baked bacon that has had sugar sprinkled over it, adds a beautiful rich caramel note that excellently complements both the salty flavor of the bacon and the that buttery one of the hollandaise sauce, it also stops the final dish from tasting overpoweringly salt or buttery which can sometimes be a problem. Finally its garnished with a coarsely chopped parsley to give it a simple elegance. place Large bowl over a simmering pan of water and turn off the heat. The eggs yolks should start to thicken. once the egg yolks have thickened its time to add the the melted butter, this should be done slowly and whilst constantly whisking. This is potentially one of the more easy points to mess up, for example if the eggs get too hot they will begin to cook and you will need to very quickly take them off the heat and somewhere cold. 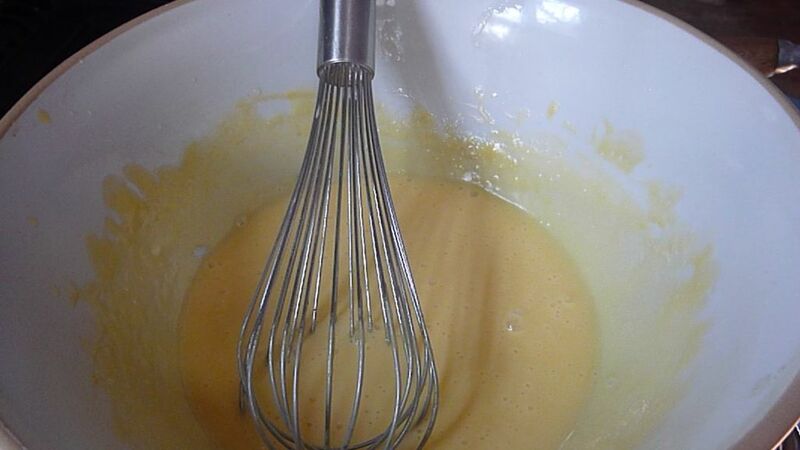 once you have used all the of the butter you and have whisking the Hollandaise Sauce will start to form ribbons as you move the whisk through this indicates that you are done. To caramelised the bacon, you are going to need around a 1 1/2 teaspoons of sugar per rasher, (this might seem like a lot, and yeah it properly is but i never said this was going to be a healthy recipe) you are going to need less if you are cooking more then one rasher because of the sugars tendency to run off the bacon slice when in the oven. Step 4: Poaching the Egg. Picture of Poaching the egg. Add salt and a good gulp of white vinegar to the water. once the water has just started simmering your ready to start, you will need to swirl the water around gently. now crack the egg in to a mug and pour with one fluid motion the egg into the the center of the vortex, as it slows down it will bring all the strands back to center and clump it all together. Your egg is ready to be taken out and served, once its started to rise, a little before and a little after that if you prefer your eggs under or overdone. Toast the English muffin or alternatively if you chose the fry the bacon you can fry the side of the muffin in the left over oil. Arrange the eggs Benedict first bacon that should be slightly golden. On top of this should be the perfectly poached egg. Finally you can salt and pepper it to taste. Finally top with the chopped or even teared parsley.